Thanks for this, the asterisk trick saves me a lot of time. Thank you 🙂 Solved a big issue for me. You are a god! I was pulling my hair out for the last hour trying to figure this out. I was creating the cert w/ a wild card in the common name and not the friendly name. Great solution! I still think it’s strange behavior from IIS, though. Thanks for the information. thank you! This helped us out immensely! I think you may have just saved my company. No, I’m not kidding. This was a life saver. Found it and is very useful documentation. Microsoft should make sure that this gets documented and published and provide a link to this website as an acknowledgement if not reward. Suggestion though it might be too late, please correct the text “SLL” to “SSL” in the article’s title. Thank you for the heads up on our spelling faux pas. Over one year has passed since the articles original publication and you are the only person (that we know of) who has caught the error (ourselves included). The error has been fixed! Thanks, this was the thing I was looking for!! Did anybody encounter the same problem, and more importantly does anyone have an solution? Thank you very much, it’s very useful ! As for everyone else here, was struggling with a different “solution” to the appCMD (not that I mind working from the command line, just that it’s inconvenient for something like this). Worked great and solved my problem! Excellent tip! I stumbled upon this but couldn’t figure out how to replicate it on another server. Changed the friendly name on the cert and it worked perfectly. This is really uncrediable. I think this is a bug of IIS, where the “Friendly Name” field was checked instead of the “Object” field. This is simply amazing! I was struggling with workarounds for this problem for quite some time. Thanks a lot! This post saved me a lot of time. Thank you! Been looking for a way to do this for a long time (appcmd wasn’t working for us). 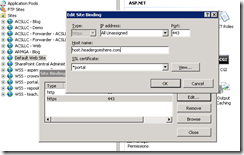 Pity I hadn’t found this article earlier (probably because I thought it was SharePoint specific). Ooops, spoke too soon. Though the change to the friendly name works for 1 certificate on one site, if we try the same thing on another site (on the same server) with a different certificate, we run into the exact same problem…it sees that the binding is already in use, and it changes the first site’s associated certificate to the new one. Any idea how to get around this? 2 different domains, 2 different sites, 2 different SSL certificates, but HTTP & HTTPS binding required. Our current approach is to assign a different IP to each domain, thus allowing us to simply bind to the IP address, but we’d like to avoid having to do that for each site. The solution we present only works for a single certificate. It works because the stream is decrypted by a known certificate which exposes the URL for host header processing. In a scenario where more than one certificate is used, the URL is unknown (or more specifically, encrypted) which prevents host headers from working. Therefore, you cannot use host headers to select the certificate to perform the decryption step (the classic chicken and egg). If multiple certificates are required, the only solution we are aware of is to map a certificate to an IP address. This concerns any multi domain site, not only sharepoint. I work for a cloud services group that hosts a client who recently expanded their operations globally. As part of that expansion, they needed to add a sub-domain for each and every country in which they did business. Had I not seen this article in my research, I was doomed to write a verrrrrrrrrrry long appCMD script long hand. Great! I’ve never seen anywhere that mentions friendly name begin with *. Definetely you solved my problem, appreciate it, thanks so much! You just saved my bacon, brilliant! This is not working for me. The IIS7 site binding host name is still greyed out. Any ideas? Hey….thnx for the tip. I’ve tried this on the development server and it works fine. However, I’m trying to understand the basics behind how this works. After renaming the friendly name for the SSL certificate, I observed the other site that was set up to SSL with this certificate automatically associated itself to the new name of this certificate and both the site were up & running just fine. 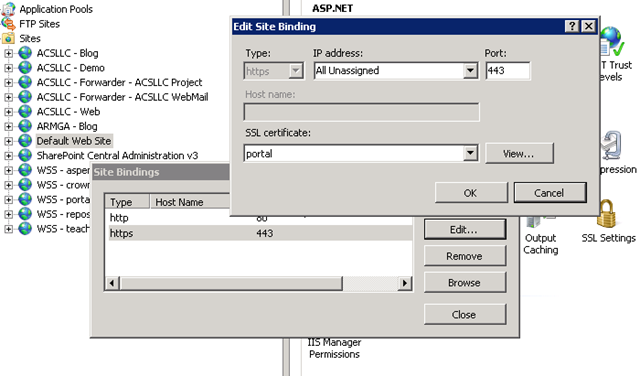 Any idea whether IIS considers two different copies of the same certificate? 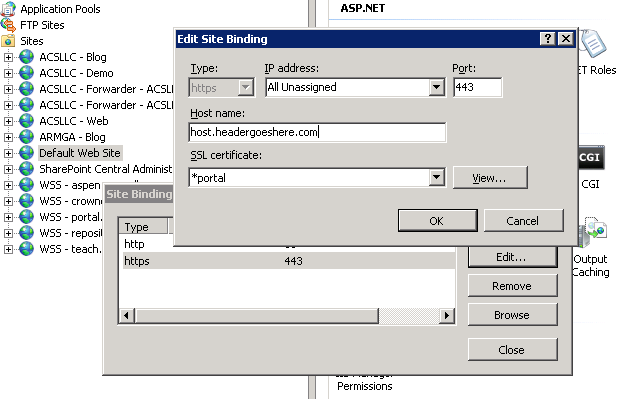 Or is it just one of the cases where IIS displays the certificate name as same for both the sub-sites, but internally handles them the right way? Awesome when you can write content and have it used almost 5 years later. Thank you for putting it out there! Article is very much informative and clear. Thank you for the steps. It saved my time and fixed my issue as well. Solved a big problem my. This worked for me, except the one site still throws a certificate warning. I can still get to the site after confirming that is what I want to do. Any idea why this might be happening? Never mind my questions – cert was issued for single web site only. I am working on getting a multi-domain certificate now. Thanks. Amazing – thank you!!!! One question … the first site shows green lock but second doesn’t? Any ideas? We have no idea on the green lock. Usually that is a factor of the browser and the SSL certificate. Thank you SO much ‘ArmgaSys’ for sharing this. It really helped me out. Seems like me. He loves beer and coffee, I sayd.